Copyright © 2003 by Craig Dremann of The Reveg Edge (sm). To read more about that the "War on Weeds" is over, click here! The Level of Technologies for Weed Management and Non-riparian (upland) Ecological Restoration in California today, may be equal to the level of the technologies of the most powerful computer in 1952-1956, the Illiac-1. 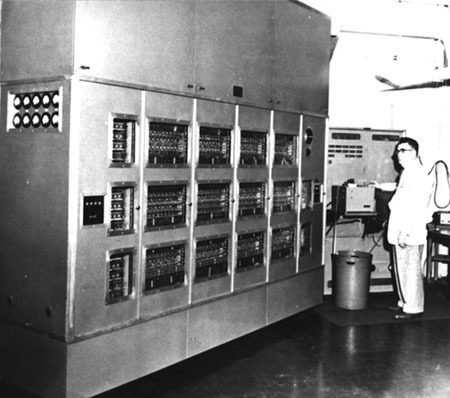 The Illiac-1 in 1952-1956 was the most powerful computer of its time, weighed in at 10,000 pounds, and stood 10 feet tall, 2 feet wide and 8-1/2 feet long, was made with 2,800 war-surplus radio vacuum tubes, and cost about $30 million in today's dollars. It's powerful computing technologies could do 200 calculations a second, using 5K of RAM, with a stored memory of 64K. That's about the level of weed management and non-riparian (upland) ecological restoration technologies that exist today: Cumbersome, inefficient, extremely expensive technologies that barely function, and that are almost impossible to use on any large scale (to manage the 25 million acres of yellow star thistle in California, for example). 1. ELIMINATE IMMEDIATELY, the Use of All Inefficient Weed Management Tools that Have Never Worked on any large scale to manage weeds and restore local native ecosystems in California: like burning, grazing, tilling, herbicides, etc. As long as you keep using the inefficient and ineffective tools, you will never get around to inventing the truly efficient tools for weed management and ecological restoration. 2 GET SUFFICIENT ANNUAL BUDGETS to Manage All the Exotic on All of California's Public Lands Within 30 Years. That means all Federal lands, all Caltrans roadsides, all County roadsides, all State lands, all County and City parks, all Open Space Trusts, all Reservoirs, etc. That also means that you have to have to invent the technologies necessary to manage 3-4% of the total State-wide exotic plant cover annually, to manage them completely within 30 years. On a smaller-scale, a sufficient annual budget means $5 million a year for every 1,000 acres of oak woodland or native grasslands that you are managing. 3. KNOW WHAT YOU WANT in the place of the exotic weeds, once you've managed them. What if you are able to eradicate all the 25 million acres of Yellow Star thistle in the State---would you just be leaving a huge vacancy for some other weed to take its place? Or, while you're in the process of weed management, should you be converting the land back to a solid, weed-free, original native ecosystem? 4. INVENT NEW TECHNOLOGIES where a Single Person Can Convert at Least One Square Mile of Exotics back to 90%+ local native plant cover, within one year. With 25 million acres of Yellow Star Thistle alone, if you have a technology where one individual annually can eliminate and convert one square mile back to local native ecosystems, then it would take about 4,000 people ten years to do the whole State. 5. ANNUALLY COMPILE EFFICIENCIES of the Various Technologies and Processes that are Available. How many acres can one person complete in one year, using which technologies, and back to what quality of native plant cover? I would suggest using one single weed species for these tests, like Yellow Star thistle or one of the annual weed grass species like wild oats or ripgut grass, so the different technologies can be fairly compared with each other. 6. USE A SINGLE WEED SPECIES like Yellow Star Thistle, to Measure All Your Tools or Newly Invented Technologies Against. Since YST is the easiest of all the California exotic plants, to convert back to native plant cover, why not use it to measure the efficiencies of your tools or the technologies you invent? 8. UTILIZE YOUR LOCAL NATIVE SOIL SEED-BANKS before it is too late. In many parts of California, there's a 100+ year old local native seedbank still viable in the soil, underneath the exotics, ready to sprout up and replace the exotics once we have managed them. This extremely valuable ancient living native seedbank is already over 100 years old, and is probably reaching its maximum lifespan. We perhaps have another 10-20 years to successfully utilize this native seedbank while it is still alive, and we need to pour as much money possible into its research and utilization. See the ECOLOGICAL RESTORATION June 2002 cover story, about utilizing 100 year old soil seedbank to convert 74 acres originally 99% exotic plant cover, back to 85%+ local native plant cover within three years, without any seeding or planting of native plants. 10. REMEMBER THE RULE OF FOUR-TIMES: Whatever weed management and ecological restoration technologies you employ, your technologies must be able to convert the exotic weed cover back to local native plant cover, four times faster than the weed originally spread. Otherwise, you'll never be able to catch up with exotic plant infestations. For example, let's say that it took 100 years for California's 25 million acres of grasslands to get infested with Yellow Star thistle. Then, any technologies you use, should be able to eliminate California's Star thistle four times faster than it took the land to get the infestation--or 25 years. That means, your technologies for managing Yellow Star thistle in California, should be robust enough to successfully convert one million acres annually. Text and photos of this talk, presented in Monterey at the BLM "War on Weeds" meeting, November 14, 2003, updated November 18, 2007.